Armed Forces of the Philippines spokesman, Brig. 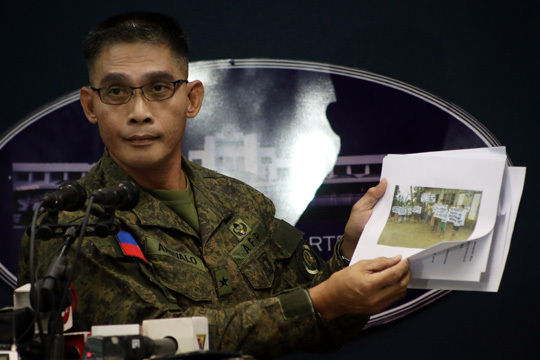 Gen. Edgard Arevalo, presents photos and documents showing persons protesting against members of the New People’s Army, during a press briefing Wednesday at Camp Aguinaldo in Quezon City. Arevalo said AFP Chief-of-Staff, Gen. Carlito Galvez Jr. maintained his accusations against Satur Ocampo and Act Teacher Party-list Rep. France Castro. Topics: Armed Forces of the Philippines , Edgard Arevalo , New People’s Army , Carlito Galvez Jr.